Da Bears Blog | How much is too much to pay a quarterback? How much is too much to pay a quarterback? I recently talked about just how quickly the salaries of established quarterbacks are increasing relative to the salary cap. In it, I found the top 15 or so quarterbacks have salaries that are increasing at a rate disproportionate to the salary cap. Today, I want to look at the amount of money Super Bowl teams spend on their quarterbacks. So I looked at the cap hit (as a percentage of the total cap) of the highest paid quarterback on the roster for every Super Bowl participant since 2000, as well as where that ranked among NFL quarterbacks. Since there have been a few instances of teams having a guy who was not their highest paid quarterback start for them in the Super Bowl, I decided to go with the highest cap hit for a quarterback on the roster instead. 2010 is not included because it was an uncapped year. All salary cap data from 2000-2009 comes from the USA Today database. All data since 2011 comes from Spotrac. There are several interesting tidbits I’d like to point out here. It is possible for teams to spend a premium on a quarterback and still compete for the Super Bowl. 7 of the 28 teams in the list (25%) had a quarterback who had one of the top 5 quarterback cap hits in the NFL that year and made the Super Bowl, and 4 of those 7 teams won. This might illustrate Peyton Manning’s career pretty well: he’s the only quarterback taking up more than 12% of his team’s cap to go to the Super Bowl, and he did it twice: once at 14.2% and once at 17.8%. Both of them dwarfed the 11.8% any other quarterback has accounted for while making the Super Bowl. Of course, he lost both times, which might reflect that he was taking up too much money, leaving his team weak in other areas. 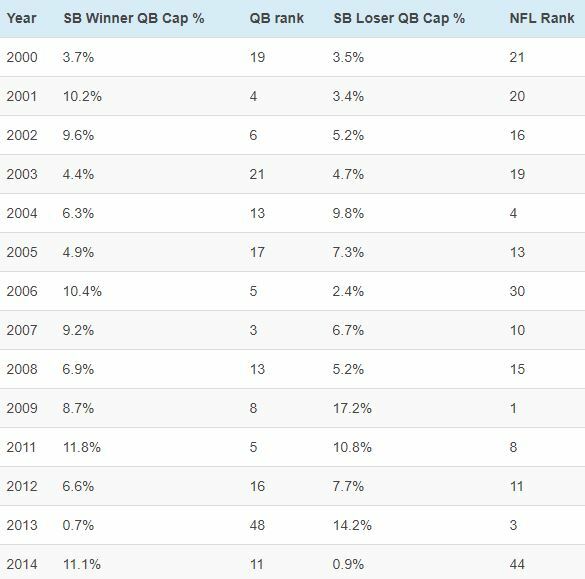 On the opposite end of the spectrum, the Seahawks made the Super Bowl in back to back years without a quarterback accounting for even 1% of the cap. And in both instances their highest paid quarterback was Tavaris Jackson, not Russell Wilson. That helps explain why they were able to afford so many high quality players at other positions. Overall, this isn’t really a repeatable pattern, as it’s extremely rare to land a quarterback outside of the first round of the draft who plays at such a high level so quickly. When that happens, your team basically gets an extra 10% of the cap to work with over everybody else. So how much is too much to pay a quarterback? That’s the question teams are going to have to answer in the coming years as quarterback contracts continue to climb. The answer obviously varies depending on the caliber of quarterback. Somebody like Peyton Manning deserves to be paid more than Matthew Stafford. But no quarterback in the NFL, no matter how good, has won a Super Bowl in the last 15 years while using up more than 12% of his teams’ salary cap. Of course, with quarterback contract inflation, that may not hold, as nine quarterbacks are currently slated to have a cap hit of at least 12% of their teams’ total cap ($17.2M) in 2015, including presumed Super Bowl contenders like Green Bay and Denver. I am skeptical that a middle of the road quarterback like Stafford (or Alex Smith, Jay Cutler, Andy Dalton, Colin Kaepernick, etc.) can win a Super Bowl while on a contract paying him more than 10% of his teams’ salary cap. I am also skeptical that anybody can win a Super Bowl when their quarterback’s cap hit is astronomical, such as we see in 2015 with Drew Brees (18.5%, $26.4M) or Tony Romo (19.4%, $27.8M). In my opinion, it’s not a coincidence that we are seeing players like Tom Brady and Peyton Manning take contracts, pay cuts, or restructures that keep their cap hits a little lower. Brady won his 4th Super Bowl in 2014 with a deal that guarantees him almost all his money but never puts his cap hit above $16 million. Manning just agreed to come back to Denver on a reduced contract that dropped his cap hit to $17.5 million. Between those moves, the financial disarray teams like Dallas and New Orleans are in due to absurd quarterback contracts and restructures, and the pay-as-you-go deals signed by Colin Kaepernick and Andy Dalton last offseason, I can’t help but wonder if we have reached a tipping point with quarterback contracts. They have absolutely exploded in the last 3-4 years, and teams might be starting to realize they overpaid. I wouldn’t be surprised if teams make more of a concerted effort towards more reasonable quarterback contracts going forward, but that is going to be difficult to do, as players typically like to be paid more than the guy before them was (as we just saw with Ben Roethlisberger’s new deal, which set several records). With Eli Manning, Philip Rivers, Cam Newton, Russell Wilson, and Andrew Luck all coming up on new deals in the next 12 months, it will be fascinating to see if the quarterback market continues its (possibly counterproductive) upward trajectory, flattens out, or begins to decrease.